"A great soup for casual entertaining." Pat chicken dry with paper towels and season with salt and pepper, if desired. Heat oil in a large skillet over medium-high heat. Add chicken and brown lightly, about 2 minutes per side. Transfer chicken to 6-quart slow cooker. Reduce heat to medium and add onions to skillet. Cook for 2 to 3 minutes or until onions begin to soften. Stir in garlic, minced chile and bouillon powder; continue cooking 1 minute. Pour in 1 cup water and stir well. Remove from heat and pour into slow cooker. Add remaining water, hominy, oregano, bay leaf and lime juice. Cover and heat for 4 to 6 hours on LOW or 3 to 4 hours on HIGH. The soup is ready when the chicken is tender and can be easily pulled apart. Shred chicken using two forks to pull apart. Ladle soup into bowls and let guests garnish the soup as desired. Plenty of great flavors here but it needs a bit more hominy. I like cilantro on my pozole. Absolutely delicious! I was generous with the fresh lime juice and made it with fresh cabbage, radishes and avocado as garnishes! Will definitely make it again!! This is a hit! It’s absolutely simple and delicious! 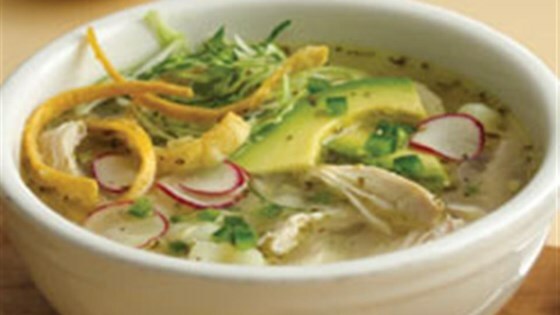 My family never really ate pozole blanco but they love this one! Very delicious. Prepared just as directed and it came out fantastic. If you haven't tried it yet...I would recommend you should.